Why purchase your lime from a Grolime producer? When buying your agricultural lime, you should always buy from a registered Grolime producer. All Grolime producers are committed to the highest standards of production and quality control. Currently all Grolime producers are members of the Ground Limestone Producers Association of Ireland (GLPAI). In addition, all members of the GLPAI are licensed by the Department of Agriculture, Food and the Marine to market their agricultural lime in Ireland. The GLPAI engages regularly with the Department of Agriculture, Food and the Marine to ensure that all of its members are fully up to date with developments in relation to regulation, enforcement, research and liming advice. In addition, Grolime producers have also voluntarily agreed to have their production locations independently audited by an accredited laboratory on a twice yearly basis for compliance with regulatory standards. All Grolime producers are licensed by the Department of Agriculture Food & the Marine. In addition, all Grolime producers must comply with regulations governing the use of the Grolime trademark. One of the key requirements for compliance with these regulations is that each production location wishing to market its lime under the Grolime brand must have its product sampled and tested by an independent accredited laboratory on a twice yearly basis. The independent testing includes grading and Total Neutralizing Value (TNV). This testing requirement is implemented by unannounced visits by the independent laboratory to each location where samples are taken and tested for total Neutralizing Value (TNV) and grading requirements. Any producer that does not meet the TNV and grading requirements outlined in national legislation will have their entitlement to use the Grolime trademark withdrawn. All Grolime producers are members of the Ground Limestone Producers Association of Ireland (GLPAI) which is the representative body for the agricultural lime producers in Ireland. The GLPAI, as the recognised voice of the industry, regularly engages with other stakeholder bodies such as the Department of Agriculture and Food and Teagasc. Therefore Grolime producers are always fully up to date with changing requirements and standards. 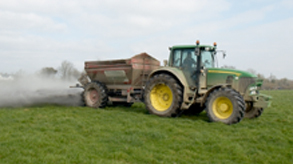 In addition, Teagasc and GLPAI have organised training events for sales staff in order to ensure that they are in a position to assist their farming customers in all aspects of soil management. Go to our news section in the library for more details on the most recent training event. All Grolime producers have a proud track record of serving their farmer customers with quality products, some for generations. Many of the companies are also involved in manufacturing products such as aggregates, ready-mixed concrete and precast concrete products which are used to construct the built infrastructure of farms throughout the country. Grolime producers are acutely aware of the expectations and needs of farmers and are ready to assist them in all aspects of the farming enterprise. You can always find a Grolime producer in your locality. There are approximately 28 locations across the country where you can buy your Grolime. Go to the “Producers” section on this website to find you nearest registered Grolime supplier.